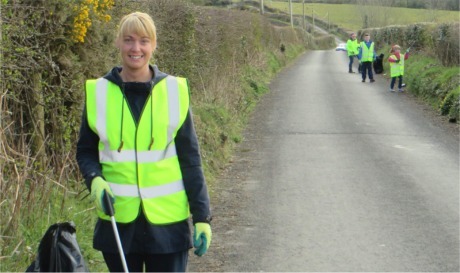 MORE than two tonnes of litter was collected during the Big Inishowen Clean Up day last Saturday, Donegal County Council has revealed. The local event saw community-spirited local people, clubs and groups pick up litter in their own areas. Local residents showing great community spirit at the Big Inishowen Clean-Up at Birdstown, Burnfoot, on April 9. Council litter warden Pearse McCrory commended the "tremendous work" of people in various towns, villages and rural areas across the peninsula. 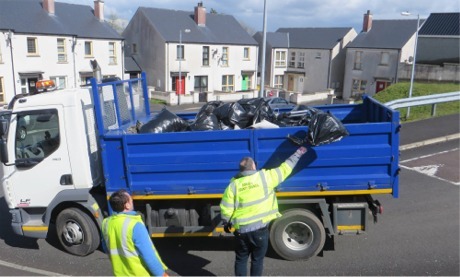 “Our mobile litter unit picked up over two tonnes of waste over the weekend and this does not include the waste collected in Buncrana and Carndonagh," said Mr McCrory. "It was great to see such strong community spirit and the sense of pride that people have in their own areas." Martin Roarty and Noel O’Donnell from Donegal County Council collecting rubbish picked up by residents in Bridgend. Further community clean-ups are planned for this Saturday, April 16 in Moville, Greencastle and Muff. Anyone interested in helping out should contact Cllr Martin Farren or Marian McDonald for Moville and Greencastle or Mura McLaughlin for the Muff community clean-up. There will be a clean-up in Carrowmena on Saturday, April 23 and anyone who would like to take part should contact the community centre. A clean up in St Johnston will also take place on April 23.